The Superman Cufflinks are the secret to the Man of Steel's powers! Clip a pair of these awesome superhero cufflinks to your wrists and flaunt a look that will rival Clark Kent. 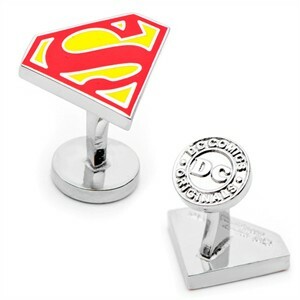 Gleaming with the Superman logo, these unique cufflinks are officially licensed by DC Comics and constructed with quality enamel. Save Metropolis and look good doing it with our Superman Cuff Links! Availability: The Superman Cufflinks within approximately 1-2 business days. Please note: This item includes free GROUND shipping.